Israeli Defense Minister says 'biggest problem' with two-state-solution is demographics, Tzipi Livni says anti-Semitism 'saddens' her. 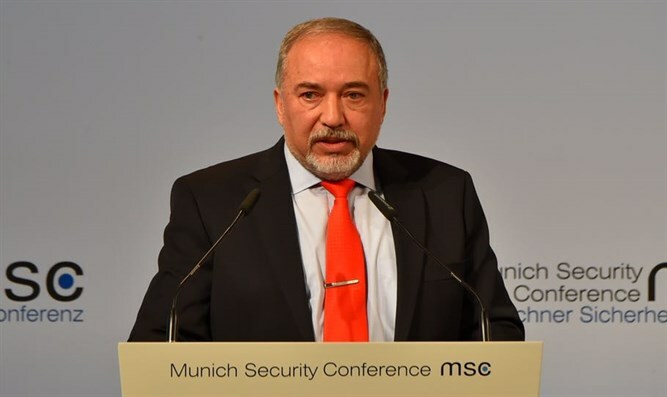 Israeli Defense Minister Avigdor Liberman (Yisrael Beytenu) spoke on Sunday at the Munich Security Conference about the Israeli-Arab conflict. "My vision and goal is, without a doubt, the two-state solution," Liberman said. "I believe that we must ensure Israel remains a Jewish state. The basic solution must include a land swap, and a population swap. "There are a lot of misunderstandings. The biggest problem is that we are willing for them to have a Palestinian state without a single Jew in it, but in Israel, 20% of our population will be Arabs. We cannot create two states this way. "We have a right-wing country right now. The problem is that we are all looking at the past: We had Ehud Barak, Ariel Sharon, Ehud Olmert, and Tzipi Livni - they all met with Abbas and were willing to sign on a two-state solution in the White House - but at the last minute, Abbas refused to sign," Liberman explained. MK Tzipi Livni (Zionist Union) also participated in the conference and said, "It's absurd that Iranian Foreign Minister Mohammad Javad Zarif Khonsari is funding Hezbollah's terror attacks on Europe - but he is legitimized and honored in a European security conference. "Every Jew, everywhere in the world, needs to feel safe and be able to walk with a kipa without fear. Hiding is not a solution. We've been there. A Jewish state means that the Jewish nation has responsibility for the safety of Jewish communities around the world. "It saddens me to hear about the rise of neo-Nazis in Munich. The local leadership and authorities need to take responsibility - because anti-Semitism rises as a result of the local community."